Access to applications, data, and resources on the Internet is mission-critical for every organization. Downtime is unacceptable. Security for that network must also be highly available and not cause performance degradation of the network. The increased workload of security devices as they analyze traffic and defend users from malicious attacks strains computing resources. The next generation of security solutions must build in high availability that can scale as the business changes. 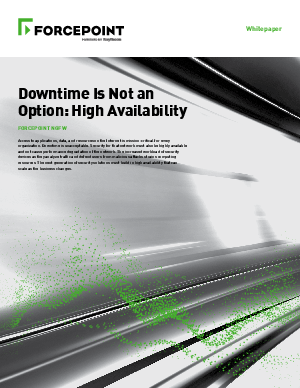 Download this whitepaper to find out how high availability is at the core of the Forcepoint NGFW (Next Generation Firewall).